Sahara is a strong, rich tobacco blend that is both hearty and sweet. I have used Sahara for years and now use it with 0 mg of nicotine for last year. I only use clearomizer for over 5 years. Great tobacco flavor with a unique, somewhat sweet aftertaste. Apollo's Sahara compares with no other, and yet it is subtle enough for an average tobacco lover IMO. My #1 at Apollo. yeah my experience wasn't so great. One of the e smart batteries failed after a few uses and the sahara vape juice was unlike other sahara juices. Shipped quickly. Sahara is not like other tobacco flavors. I think if you still haven't found your favorite tobacco flavor then Sahara would be one to finally give a try to. Was recommend to me because I do not like sweet flavors. This tobacco ended up being perfect blend for me. I use it in my Neo pen and everything has been working exactly as it should. I do not personally get any sweetness from this one. It reminds me of a dry tobacco but it has been very enjoyable and it seems almost old fashion to me. Glad I finally tried this one because I was going with a different company and didn't really like the flavor how I like this one. I always get this one for my dad and he seems to be liking it. It has helped him quit smoking which is what is important to me. thank you apollo for making this flavor. he says it reminds him of camel cigarettes. he has been using this one for a long time now. This one is a lot different than the Classic Tobacco. I had to try a few tobacco flavors before I was able to find one that I actually enjoyed using. But now that I'm using this one I really like it and wanted to wait a little bit of time before I wrote about it. I do recommend this one to people who maybe haven't liked some of the other ones. I feel like it is a stronger and more bold tobacco taste. This is one of my favorite tobacco flavors of all time. It is very smooth and has a good throat hit due to it being 50/50. It reminds me a lot of camel cigarettes which might be why I like this one as much as I do. I really enjoy a good tobacco flavor because fruit ones aren't for me. I also really like Apollo's Classic Tobacco and RY4. Really good job! It is so good! It is my favorite, and nobody makes it as good as they do. In a class of its own! Dusty-dry, curiously exotic-flavored, medium bodied, as good as it gets. I wonder if any of Black Note Co.'s lines bear any similarity. Sahara is an apt name and this is a classic cool juice with very little sweetness. Should be THE representative vape for Apollo. This is tied with halo tribeca as my favourite RY4 of all time. Apollo's is cheaper by 5 dollars per 30 ml therefore will become the only RY4 I order from now on. 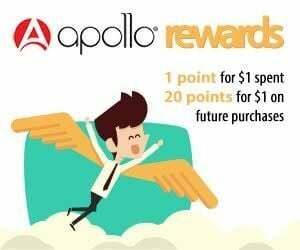 Not to mention fantastic intermittent sales Apollo has. Basically, honestly it tastes exactly like Halo Tribeca and believe me that is a compliment as Tribeca is one of only 2 outstanding liquids that company makes (apollo are far better in all other flavours, far better). Not much can be said about RY4 that already hasn't - it's a smooth liquid that has a touch of sweetness, a touch of nuttiness, a smooth tobacco base that is not in any way overpowering, thus making it suitable as an all day vape for anyone. Nice vapour, nice throat hit, nice job Apollo. Many other RY4 brands have a burnt aftertaste and apollo have managed to completely avoid this. Yet another very top of the line juice from Apollo. I'm new to vaping, trying to get off analog cigs. Hubby got me the Apollo Extreme kit and I got some blank cartomizers to go with and chose Sahara (24mg) as my first e-liquid. I'm so glad I decided to try this! It's smooth, rich without being harsh, and has a good "Turkish" flavor. I detect a faint hint of clove that goes very well with this blend. The vapor this puts out is also impressive. This one really satisfies my tobacco cravings. This is day three of being tobacco free after smoking for 38 years and thanks to Apollo I think I might just make it! I've tried several flavors and the Sahara and the RY4 are by far my most favorite. It's almost a toss up between the two but I'd have to give the edge to Sahara as it's got a very smooth and refreshing tobacco taste whereas the RY4 is a little more sweet tasting. Well, so far its my favorite ejuice, but I do have to say the flavor mellows quite a bit with age. Its smooth, tasty, a bit like cafe mocha to me, whereas new unsteeped its definately coffeish. Overall tho, its very satisfying. I used Sahara 2.4% from V-2 can you give me a strength that is comparable with that. Trying to make a switch has not been easy task since they are now closed.